Finding exactly what you need is a very difficult task, especially when you’re looking for a mattress that could satisfy all of your needs. If you’re tired of trying to pick a suitable mattress, I’ve got good news for you. There’s a company dedicated to making your sleep better. 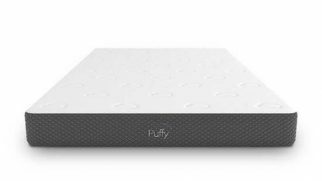 In today’s Zinus mattress review, we are going to take a look at one of their most popular models, the Pressure Relief Memory Foam mattress, and find out whether it can meet all your expectations. 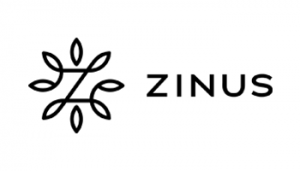 Is Zinus Mattress for You? 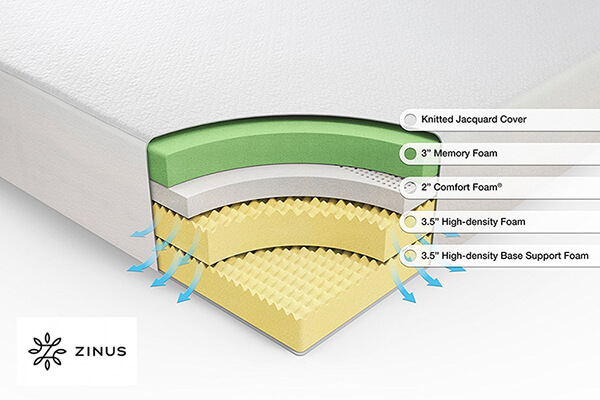 Let’s start this review of Zinus memory foam mattress with the most important part, it’s construction. Now, we all realize that the filling of a mattress is what makes it either good or bad. The materials used, the thickness of layers, their position, and the number of layers – all of these factors can either ruin your nights or improve your sleeping experience. The 3” memory foam layer, adaptive and enveloping. The 2” comfort foam layer, pressure relieving. The 3.5” high-density base layer, sturdy and supportive. The 6” high-density base support foam layer. 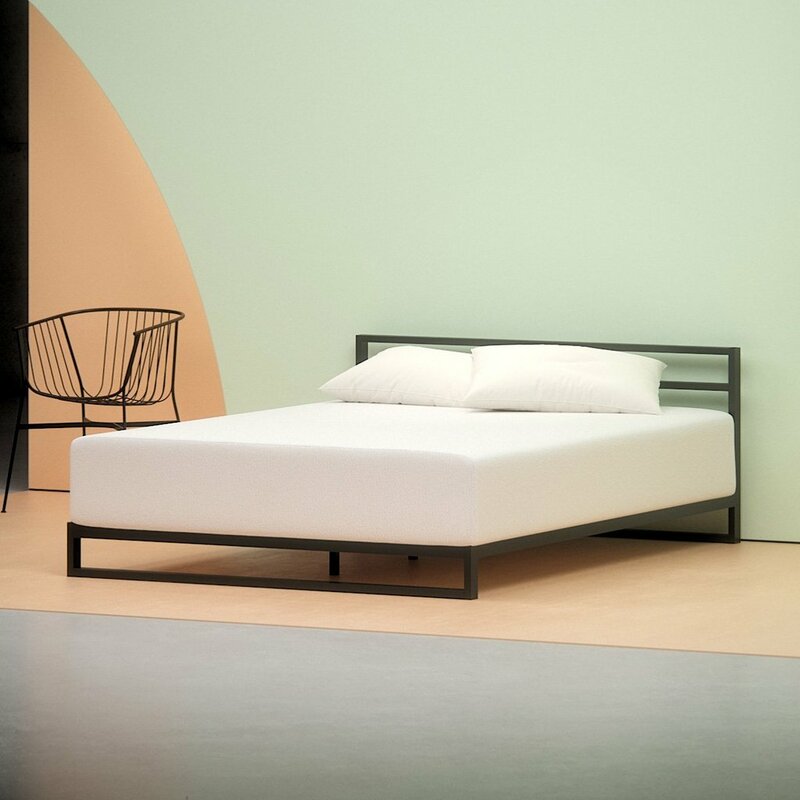 The materials used in this mattress might surprise you (they certainly did surprise me, given the fact how reasonably priced this mattress is). First of all, the foam is CertiPur-US certified, which means it doesn’t contain any harmful components or harsh chemicals. It’s not organic either, but 100% natural mattresses cost much more than this one. Another interesting thing about the construction of this mattress is that the foam is infused with the green tea extract and active charcoal. The green tea is meant to add more freshness to the product, while the charcoal works as the moisture absorbent, which also reduces the unpleasant odors. Your usual sleeping position can help you determine what kind of mattress you need. If you prefer sleeping on your back or stomach, you can go for a firmer mattress. However, if you’re a side sleeper, the most suitable option will be a softer mattress. The cover is what contacts our body the most even through the sheets. It can cause allergies or be super crunchy and unpleasant to the touch. So yes, it is very important. Zinus uses stretchy jacquard fabrics to make their covers. 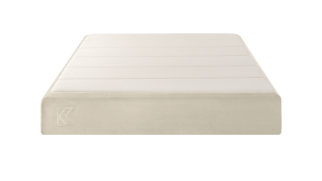 This particular model, the Pressure Relief Memory Foam mattress, features a soft cover, which is snow-white at the top. The sides of the cover have tiny holes in it for the free airflow, which helps regulate the temperature during the night. This model has a pure foam feel. It is soft and bouncy at the same time; plus, it’s very responsive. If you’re used to 100% foam mattresses, you’re going to love how this model feels. In terms of firmness, it’s somewhere in the middle. On a scale from 1 to 10, this mattress is probably 7, which is a rather comfortable level of firmness. It won’t be likely to hurt your pressure points even if you’re a side sleeper. The level of support is what I appreciate the most in a mattress. I think you’ll agree with me when I say that it’s impossible to have a restful sleep when your body isn’t supported properly. In my opinion, you won’t face such issues with this Zinus mattress. It is very supportive and bouncy. I guess the base layer really does its job well without making you feel like you’re sleeping on concrete. Plus, the top comfort layers contribute to the pressure relief. They allow the heavier body parts to sink in a bit deeper, reducing tension from the pressure points. As for the edge support, that’s when this mattress surprised me once again. You see, foam mattresses usually lack that sturdiness on the edges. But Zinus showed better results than I expected. The edges of the mattress are very bouncy too and don’t sag too much under the weight of the body. So, if you enjoy sleeping on the edge, don’t worry about rolling down during the night. If you sleep with your significant other, pay close attention to this part of my Zinus mattress review. Motion transfer levels are important, especially if your partner’s movements during the night can wake you up easily. The thing is that motion transfer depends on the foam density and the firmness of the mattress. This Pressure Relief Mattress is average firm, which means it offers a rather decent motion isolation level. I used my favorite Margarita glass to test how my movement will disturb it – and it barely moved. What I’ve noticed about this mattress is how adaptive and contouring it is. However, the most interesting discovery that I’ve made is that it allows minimum sinkage. I don’t know about you, but to me, it is a perfect combination: the mattress contours the shape of your body and allows the pressure points to sink into it (for just a couple of inches) while remaining bouncy and supportive. The fact that the foam in this mattress is CertiPur-US certified doesn’t mean that it’s 100% natural, organic, and made by hand somewhere in the blooming fields of Switzerland. Foam, even when it doesn’t contain any harsh chemicals, can still have a specific odor. When I unpacked this Zinus Mattress, I could feel a slight off-gassing. It wasn’t too bad, I must say, but it took approximately a day to disappear. 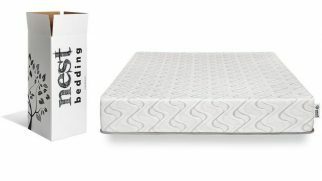 There are some additional features I want to mention in this Zinus mattress review. Firstly, it’s the green tea extract infused foam. You might think that it’s just a trick to make you buy the mattress (that’s what I thought too). The thing is I’m not quite sure how effective the extract really is when combined with the mattress foam, but at least I could feel its odor. After the off-gassing was completely gone, the mild scent of green tea appeared, which reminded me of that soft smell of the green tea essential oil. So, with this Zinus mattress, you’ll feel like sleeping on a fresh bed every night. Vacuuming your mattress regularly will help you keep it clean, fresh, and free of dust and other nasty things that are hiding inside. Another point I want to talk about is temperature regulation. It’s not a secret that foam mattresses tend to make you sleep hot. However, Zinus is different. It looks like the holes in the cover really help with the airflow, as I didn’t sleep hot on this mattress. It didn’t make me feel cooler either, but let’s be realistic: without an additional gel layer, foam mattresses can’t do that. Anyway, you won’t wake up all red and sweaty after sleeping on the Pressure Relief Memory Foam model. What can make you fall in love with this mattress is its support. Seriously, that base layer really does a great job. When sleeping on this mattress, I felt comfortable in different sleeping positions and woke up well rested. My neck tends to hurt from time to time, but I didn’t experience any pain after sleeping on this Pressure Relief mattress, which only proves that it’s able to support the body properly and keep the spine aligned correctly. The worst thing about this mattress is that it’s not suitable for all body types. Let me explain: because the top foam layers aren’t too dense, they might allow heavier sleepers to sink in deeper. And that means bad support, which can lead to back issues and sleepless nights. If you’re a larger person, it will be safer for your spine and overall health to get something firmer than pure foam, like a hybrid or an innerspring mattress. Simply lying on the mattress for 2 minutes in the showroom won’t give you a clear picture of how comfortable the mattress really is. Try to pick the company that offers a sleep trial. Only by sleeping on the mattress for at least a couple of nights, you will find out whether it’s comfortable enough for you. No matter what manufacturers claim, one mattress cannot be universally comfortable for everyone. People always have different preferences, different bodies, and perhaps even some health issues that might influence their sleeping experience. I must admit: not being a huge fan of pure foam mattresses, I expected less from the Pressure Relief Memory Foam model by Zinus. 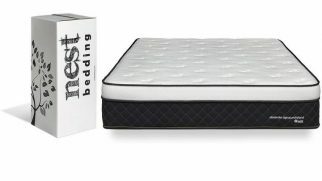 It pleasantly surprised me, to be honest, and now I can surely say that it’s one of the best mattresses in this price category. It is bouncy, supportive, and comfortable in all sleeping positions. It didn’t make me sweat during the night, it didn’t make my neck hurt, and it helped me relax completely thanks to its pressure relieving properties. Even though this mattress is simple and far from being super luxurious, do not hesitate to try it out. It has the potential to improve your sleep and help you get back on track with your sleeping schedule. Isn’t it what you’re expecting from a new mattress? What matters for you most and how is Zinus good at fulfilling your sleeping needs? Comment down below!